Over on Amazon, you can pick up a few charging accessories from Aukey, discounted with the help of a couple promo codes. On sale for $12 is the company’s wireless charging pad, compatible with the latest devices from Samsung, LG, and even the Nexus devices that support the feature. The charger uses the Qi Standard, meaning any device that supports that standard will be compatible. 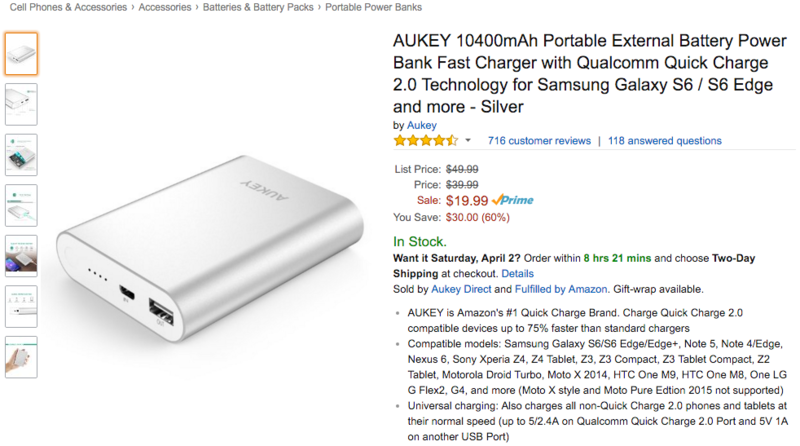 On the other hand, if you need a bit of mobile juice, Aukey is also selling the 10,400mAh portable battery for $15. This portable power bank will provide days of charge for your phone with that much capacity. The power bank features support for Quick Charge 2.0, allowing you charge your devices very quickly. Thanks to built-in safeguards, your devices will be protected against over-current, overcharging, and overheating. In order to take advantage of these prices, simply add the items you want to your cart on Amazon, then plug in the coupon codes provided below.